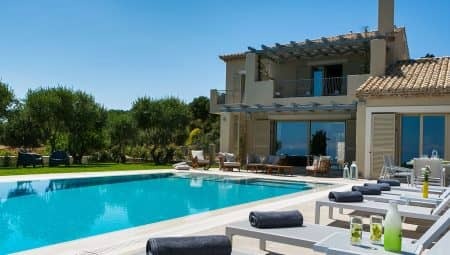 Our Review: Top of the line villa with unique design & magnificent view. Welcome to the island of diversity! A popular family destination, the island of Kefalonia is filled with contrasts, with its imposing mountains and cliffs on one hand, and with the sparkling crystal clear waters on the other. This is an island where you have to take your time exploring it and discover its numerous hidden treasures. From the north to the south you will be impressed by the beauty of its seashores, sandy or pebbled and always with turquoise waters, the lush vegetation that cover the biggest part of the island, the charming villages with its hospitable and open-hearted residents and the many historic monuments of the past. With September rapidly approaching, the holiday season is winding down. It’s not very hot but still warm and pleasant, perfect for days at the beach which is surprisingly warm. The weather is fine for activities like hiking and cycling among the lush nature, this is the perfect timing to combine beach and mountain holidays.